OutdoorSpace Inc. is an Edmonton Landscaping Company that is family owned & operated. We provide a full range of Landscaping Services for the Edmonton area. For landscaping in general, and for deck and patio planning, when we meet with clients to discuss their “OutdoorSpace” needs, we always start off by asking the following question… “How do you intend on using your OutdoorSpace”. This is a critical question that helps us understand how our clients intend on using their OutdoorSpace… BEFORE we head down the path of creating a landscape design. We truly believe that our “Outdoor Space” is an extension of our “Indoor Space”. Let me put things into perspective for you. When you build a house you spend a lot of time and resources selecting or modifying a plan or design to suit your individual or family (lifestyle) needs. So why would you not do the same when creating a design for your OutdoorSpace? With this in mind, why don’t we start with a common (hardscape) Landscape feature such as a deck or patio. These types of features are typically one of the most expensive components of any landscaping project, so why wouldn’t you take the time to make sure you’re create something that is going to work for you? All too often decks and patios are constructed with absolutely no thought or consideration for their intended use. For instance, do you plan on setting up a table and chairs for lunch or dinner, or are you are planning on using this Space to relax in some BIG FAT COMFY lounge chairs? 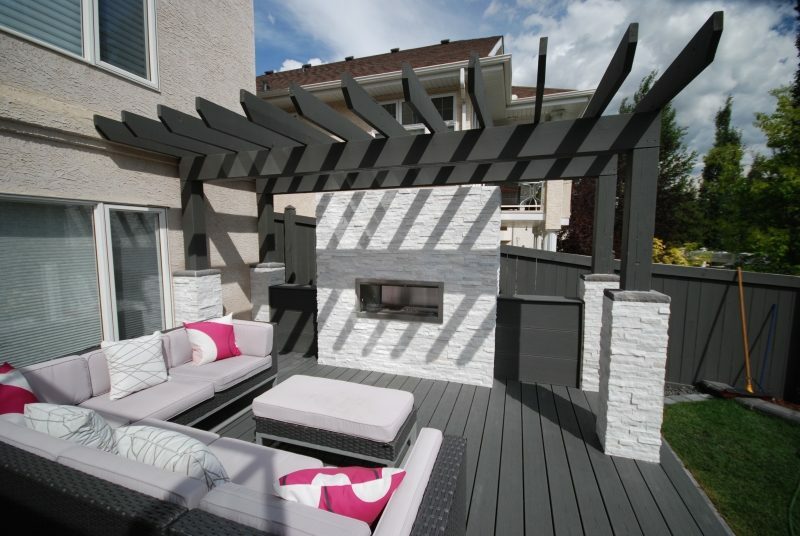 What if you intend on introducing a nice fire table to keep you warm on those cool Edmonton summer evenings? These are all things that need to be taken into careful consideration… BEFORE you create your design! Whatever the intended use, you should also make sure you create adequate space to position the furniture the way you want it. There is nothing worse than purchasing the furniture you want, only to find out that it won’t work with the space you have created. Maybe you plan on installing a gazebo after the deck and patio has been constructed? These are all things that should be taken into consideration PRIOR to constructing these types of landscape features. When we conduct Landscape Design Consultations with potential clients, we ALWAYS suggest that they consider the following before they decide on sizing a deck or patio. What is the intended use for the specific area? What does the footprint (layout and size) of the furniture look like? Are you are planning on installing a gazebo to cover the area? Once you have made the above decisions, you are now in a position to correctly size the deck or patio. If I can put this into perspective for you. Let’s say you have a “size 12 foot”. Would you go out and purchase a pair of “size 8” shoes? I think you get the idea of where I am coming from! Obtain measurements with everything positioned the way you intend and make sure you have provided yourself with enough space to sit comfortably, as well as navigate around the furniture. There is nothing more uncomfortable than being too close to a Fire Table, having your chair fall off the outer edge of a Patio or jammed up against the House or Deck railing! NOW… you are in a position to correctly size the deck or patio! Don’t put the “Cart Before the Horse”, or in this case… Don’t construct the “Deck or Patio Before You Choose Your Furniture”. We are pretty sure of one thing… if you follow the advice that we have offered, you will be glad that you did! Should you have any questions or if you would like some help designing your own OutdoorSpace… We would love to help you with that! Contact us here. Transform your yard into something stunningly beautiful. Contact us for your free quote! Very professional. The work we had done on our front lawn exceeded all expectations. We are looking forward to having Tony and his crew do more work at our home. I highly recommend OutdoorSpace. They did a beautiful job on a new patio and landscaping in our backyard. They were highly dependable, showing up on time and completing the job as promised. Tony was extremely professional and has built a very reputable company. I would definitely use them again. Highly recommend! We were at a loss and looking for solutions on how to deal with a heaving patio and deck and high water table, Tony agreed to come take a look even though he knew he probably wouldn't get a job out of it due to the nature of our issue. He provided suggestions and put us in touch with someone who is able to help for our specific problem. We will definitely be contacting Tony again when it comes time to do our other landscaping projects. Tony and his crew did an outstanding job on our full (front and back) yard renovation completed in the summer of 2017. The quality of work was superb and Tony or his excellent foreman Nick always made sure any questions we had during the process were addressed. The quote provided was clear and adhered to; the price we were quoted was the price we paid. Tony takes great pride in the work OutdoorSpace does and works tirelessly to ensure an exceptional final product. Tony is quite unique in that he has superb understanding of the technical aspects of the landscaping materials and also has a keen eye for design. My spouse and I initially had quite different ideas of what we wanted and Tony was able to incorporate key aspects of both into a beautifully integrated and functional space. We are truly delighted with the work completed and we 100% recommend Tony and OutdoorSpace for any landscaping project you may have!! Announcing a New Company and Website!